How does a "data city" look like? We did not want to show the data in a conventional way using only graphs and numbers. We also did not want to use another convention of showing spatial data – a map. The result of our explorations is "On Broadway": a visually rich image-centric interface, where numbers play only a secondary role, and no maps are used. 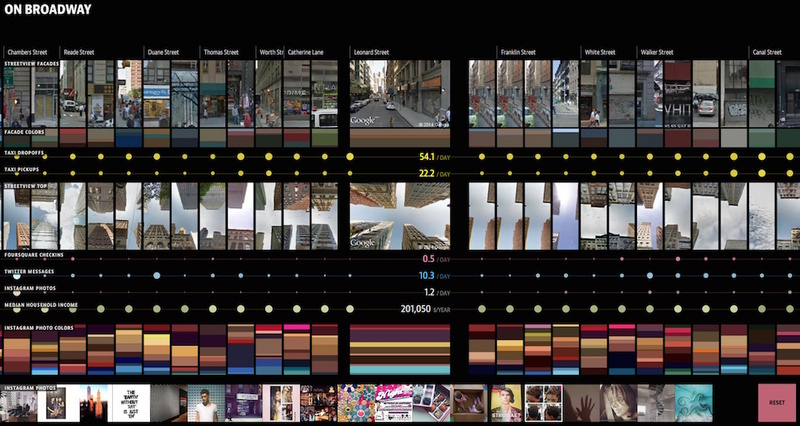 The project proposes a new visual metaphor for thinking about the city: a vertical stack of image and data layers, created from the activities and media shared by hundreds of thousands of people. There are 13 such layers in the project, all aligned to locations along Broadway. Using our unique interface (available as the online app and in large multi-touch screen installed at New York Public Library as part of "The Public Eye" exhibition), you can see all data at once, or zoom and follow Broadway block by block. Images and data include 660,000 Instagram photos shared along Broadway during six months in 2014, Twitter posts with images for the same period, Google Street View images, over 8 million Foursquare check-ins (2009-2014), 22 million taxi pickups and drop-offs (2013), and income averages for the part of the city crossed by Broadway from US Census Bureau (2013). On Broadway received the Silver Award in Kantar Information is Beautiful 2015 Awards competition. 1 2 3 Data, Fondation Groupe EDF, Paris, May 4 - October 6, 2018. Neotopia: Data and Humanity, Nabi Art Center, Seoul, November 1, 2017 - January 31, 2018. You Are Here NYC: Art, Information, and Mapping, Pratt Manhattan Gallery, New York City, September 22 - November 15, 2017. Data Esthetics exhibition, ACM Multimedia 2016, Amsterdam, The Netherlands, October 15-19, 2016. Data in the 21st Century, V2, Rotterdam, The Netherlands, December 18, 2015 - February 14, 2016. Superconduction: Challenge of Art & Technology, Riga, Latvia, November 6 - 7, 2015. Data Drift, co-curated by Lev Manovich, Riga, Latvia, October 8 – November 22, 2015. 2015 West Bund Biennial of Architecture and Contemporary Art, Shanghai, China, September 29 - November 28, 2015. Biennial Graphic Design Festival Breda, The Netherlands, September 25 - October 25, 2015 (and traveling for 2 years afterwards). Public Eye: 175 Years of Sharing Photography, New York Public Library (NYPL), December 13, 2014 - January 3, 2016.